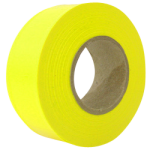 CWC standard flagging tape is bright colored and easy to see at a distance. Available in 2 and 4 mil thickness. High-grade vinyl for commercial use.